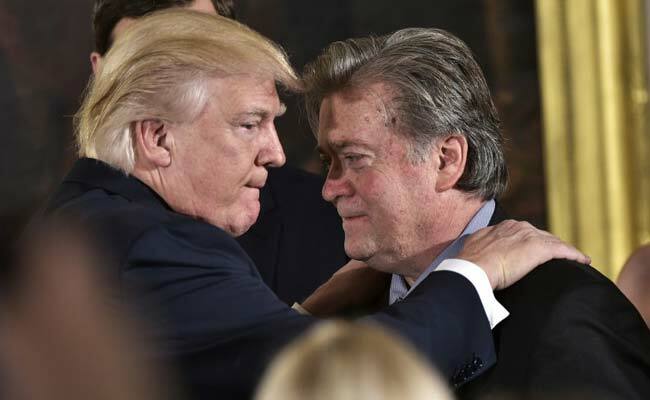 Trump on Friday dismissed Bannon, an architect of his 2016 general-election victory and the champion of his nationalist impulses, in a major White House shake-up. President Donald Trump took to Twitter on Saturday morning to thank Stephen Bannon, his ousted White House chief strategist, and took a shot at his vanquished Democratic rival, Hillary Clinton, while he was at it. "I want to thank Steve Bannon for his service," Trump said in a morning tweet. "He came to the campaign during my run against Crooked Hillary Clinton - it was great! Thanks S"
Administration officials said Trump empowered new chief of staff, John F. Kelly, to fire Bannon in an effort to tame warring factions and bring stability to a White House at risk of caving under its self-destructive tendencies. Trump's tweet made no mention of Bannon's contributions at the White House. It also referenced Bannon's arrival after the GOP primary season, a point Trump and other White House officials have made in recent weeks as they've tried to distance themselves from Bannon. Having departed the White House, Bannon is returning as executive chairman of Breitbart News, the pugilistic conservative website he helped guide before joining Trump's campaign last August, Breitbart announced Friday.